In recognition of Breast Cancer Awareness Month, NIEHS will join efforts across the U.S. to raise awareness, share information, and highlight research to help fight the disease. Every year, NIEHS funds approximately $30.6 million in research to help advance our understanding of breast cancer, its causes, mechanisms, and prevention. Research is conducted by in-house scientists, through NIEHS-funded grants, and as part of the National Toxicology Program (NTP), which is headquartered at NIEHS. Across all the institutes and centers at the National Institutes of Health, annual funding totals approximately $681.6 million. Breast Cancer and the Environment Research Program (BCERP), funded by NIEHS and the National Cancer Institute. 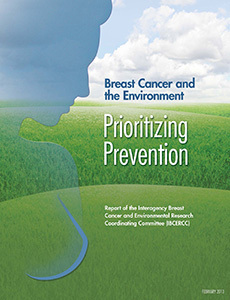 Breast Cancer and the Environment: Prioritizing Prevention (5MB), a 2013 report from the BCERP. Fact sheet on Environmental Factors and Breast Cancer Risk (1014KB), providing an overview of related research efforts funded by NIEHS. Updates on the NIEHS-led Sister Study, the only long-term study in the U.S. and Puerto Rico of women ages 35 to 74 whose sisters had breast cancer. Summaries of recent NIEHS-funded research. New research in the past year by NIEHS scientists and grantees builds understanding of breast cancer, especially with respect to the role of environmental exposures. The Environmental Factor recently highlighted several of these studies. NIEHS researchers found that an RNA-binding protein known as LIN28A is an important regulator of processes that play a role in many types of breast cancer, and, as such, is a potential therapeutic target. NIEHS grantees and colleagues found that women who were exposed prenatally to higher levels of the pesticide DDT were nearly four times more likely to develop breast cancer as adults than women exposed to lower levels before birth. The NIEHS breast cancer awareness page, noted above, contains summaries of these and other research findings. Breast Cancer Awareness Month is held every October to increase awareness of the disease and to raise funds for research into its cause, prevention, diagnosis, treatment, and cure.